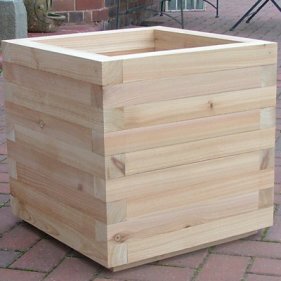 Cube cedar planters are a smart modern shaped wooden planters that can be used as a alternative to the traditional Versaille Box planters. Planted with a topiary plant or a more informal display. Made from lengths of 4.5cm x 4.5cm British grown red cedar.The base is slatted with 20mm thick planks to allow for drainage. The internal walls of these planters are now painted with a waterproof paint sealant. duplicate planters and plants placed to frame a front door, an opening in a hedge, or to mark the start or end of a pathway work well. A single vase planter , similar to our Bladon, makes an imposing focal point in the centre of a formal parterre-a popular garden feature in the seventeenth century, which is now enjoying a revival. It consists of a bed of small geometric compartments, defined by low hedging and filled with either permanent or seasonal planting to which planters add authenticity. In modern settings, geometric planters create a chic formal style planted with the clipped lavender, rosemary or santolina.